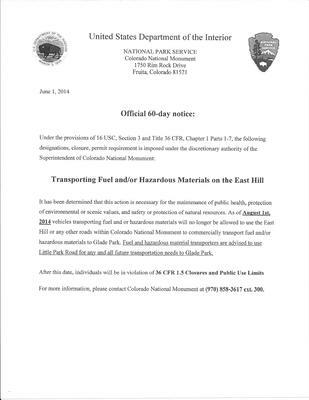 60 day notice is being given to Glade Park residents that there will be a ban on transporting fuel and/or hazardous material through the Colorado National Monument "under the discretionary authority of the Superintendent of the Colorado National Monument." Lynn Grose was on the committee that was convened to study the proposed change of CNM to National Park Status and advised against it. This is what Lynn has said about this latest development. Back in the '80's John Wilkenson, a Glade Park resident at the time, filed and won a law suit to preserve the right of way of Glade Park residents through the CNM, which they seem to have forgotten about. "In his assessment of the commercial vehicle issue, Judge Matsch stated that, while there was a "rational basis for the regulation" regarding commercial vehicle restrictions, the Park Service "misapplied their own regulation." 590 Based on the evidence, Matsch determined that Rim Rock Drive was the only all-weather access to Glade Park and Piñon Mesa and that it was "wholly impracticable" to daily assess the condition of Little Park Road. Matsch decided that, because the court already recognized the public right-of-way in that region, the Park Service's imposition of commercial vehicle restrictions was "contrary to the public's right-of-way." 591 Right of access, according to the Matsch, applied to commercial traffic as much as it did to Glade Park residents. 592 "
If you are concerned about this issue, both Mark Udal and Scott Tipton need to receive input. They are both involved in the movement to change CNM to National Park status and are requesting public input on it. This is a separate, but related issue, and on it they need to be referred back to the Wilkenson lawsuit decision. Join in and write your own page! It's easy to do. How? Simply click here to return to Glade Park Current News.